Master your own universe. I believe that every single woman (yes, that means you!) has the power to create the life that she wants and deserves—professionally, personally, spiritually, physically. It’s all within your reach! But to get there, sometimes you need a confidence coach who has the skills and experience that you can draw from to help you to become Beyond Ready, so that you reach your full potential. Are you ready to make the best choices for you—in work, in life, and in your most important relationships? I’ve designed this self-paced, interactive video, and live discussion program to teach effective and proven principles based on what I’ve learned in my life and from others whom I love and respect. I am committed to getting you to your next level. Together, we’ll make sure you’re Beyond Ready. Real examples. Clear steps. Actionable advice. I’ve created six power-packed modules featuring direct instruction from me plus exclusive interviews with individuals within my circle — successful entrepreneurs, artists, corporate executives and creators who have diverse backgrounds and work experiences. We will share the guiding principles that enabled our professional growth and personal fulfillment. Our life lessons and principles will help you define a clear vision of what it will take for you to fully apply your unique gifts and talents to live life fully and with confidence. You’re not in this alone. I am here to ensure you’re Beyond Ready. My self-paced program which consists of easy-to-follow videos, templates, resource lists and more will get you there! All of the training is online, contained in our very own private virtual classroom. Weekly LIVE web-based group sessions with me (and some special guests) will provide you the opportunity to ask questions and receive answers in real-time. Community. Our Beyond Ready private members-only Facebook group will be a place for our community to meet, collaborate, and share. Additional Content. Like you, the program will continue to evolve and expand. My team and I will add bonus content, unique personalized experiences, and growth opportunities that will be beneficial to everyone. Lifetime Access. Once you complete this part of our journey, you will have access to all of the program content including our LIVE web-based group sessions for as long as the program exists. The framework of Beyond Ready provides a step-by-step guide to create a life plan that is similar to the framework of a business plan. A business plan should be a tool you use to run and grow your business, something you continue to use and refine over time. Your life plan should do the same as you grow and evolve. Beyond Ready training modules will consist a mixture of videos, quizzes, exercises, assignments and tasks designed to extract and leverage your gifts by identifying opportunities you may not have considered as well as creating a plan to deal with challenges that are likely to arise. By the time you complete your Beyond Ready plan, you’ll have clarity, confidence and a community of the other participants to support and celebrate you reaching your goals. Knowing who you are allows you to walk in your purpose. Your Self Summary will resemble an Executive Summary of YOU, a basic outline of your mission, vision and goals. We’ll also touch on your desired target market (job, partner, client, customer or mate) and identify the opportunity for your gift to be a contribution to their lives. As we move through the course, you’ll flesh out this summary and gain complete clarity of your SELF. Imagine your gift as your “product.” Many of you have not identified what your true gift is and others are clear as to what their gift is. Either way, Beyond Ready will help you to determine your gift then take it several steps further in determining what problem it solves, how unique it really is and how to you share your gifts with your target audience. After you’ve confirmed what your gift is, it’s crucial to do your research! Do you really know the needs of your target audience? Who else is trying to reach them? Are you up on the competitive landscape? Beyond Ready will assist you with this research as well as how to position and market your gifts to attract the job, partner, client, customer or even a mate who understands and values what you have to offer. Time management and how you produce, nurture and deliver your gift is key. Quality control, your location/environment, self care and just how much you have to give to your target audience are all must-knows. Beyond Ready will help you create a sustainable daily operation plan that puts your gift in action utilizing your resources and a process. If you were to use a business plan to get financing, investors and lenders would carefully assess whether you have a qualified management team. You are your best investment and must have an understanding of the people on your personal org chart, their roles, influence, and how they contribute to your gifts and goals. Beyond Ready will assist you in building a supportive team who believes in your gift and supports your vision. Beyond Ready will truly crystallizes the concept that financial abundance is an inside job - in that it all begins with your mindset. Your financial plan is perhaps the most important element of a business plan and your life plan. Developing your financial plan will help you set financial goals that align with your plan and your future. 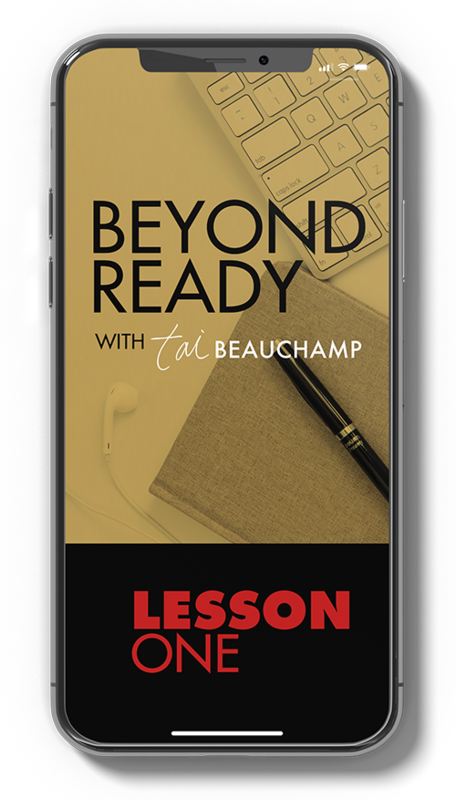 Throughout the Beyond Ready experience, Tai will empower you to take charge of your life! Bonus 20-minute virtual 1:1 coaching session with Tai! *Please Note: Does not include bonus session with Tai. *Price increases April 30, 2019.